Syracuse, NY (November 12, 2010) – A tiny American Miniature Horse named Royal Oaks Impressive Rolex showed off his jumping skills in a big way during the opening ceremony of the Syracuse Invitational Sport Horse Tournament. Rolex, owned by Stephanie Himlin of New York, is a five-year-old gelding that is registered with the American Miniature Horse Registry (AMHR). “This was the second year that Rolex took part in the opening ceremony and people remembered him from last year and it was a great success. The opening was a real crowd pleaser and people were going nuts,” Himlin said. Paris, KY (October 7, 2010) – While the recent Secretariat Festival in Paris, Kentucky was all about the famous Triple Crown winner called Big Red, some of Secretariat’s smaller equine cousins put on a show during the festival that brought the fans to their feet. Members of the American Shetland Pony Club and American Miniature Horse Registry (ASPC/AMHR) wowed the crowd with a driving exhibition, costume contest, jumping and halter demonstrations. Wellington, FL – A four-in-hand team of perfectly matched American Miniature Horses put on a dazzling show at the finale of the Dressage under the Stars competition at the Players Club & Restaurant in Wellington, proving that big things do come in small packages. 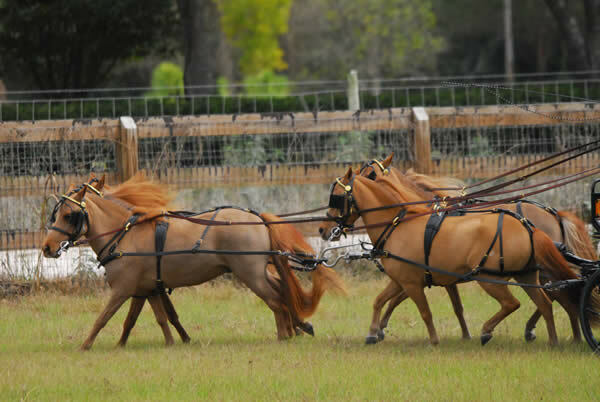 The Wee Reds, owned by Linda Kern of Caribbean Dreams Miniature Horses in Loxahatchee, Florida, and boasting 10 National Championship and Reserve Championship titles, were the opening act of the finale at the star-studded event. Combined Driver Chester Weber, the eight-time U.S. National Four-In-Hand Champion and a judge for the evening’s Dressage under the Stars finale, drove the award-winning Wee Reds in a cones course demonstration. Weber, who has driven the talented tiny team at two Wellington Holiday horse shows, also brought the judges in by carriage, much to the delight of the crowd.